There have been rumors swirling around for some time, at least in the Southern Pacific modeling community, that the “Harriman” flat car was finally going to be produced. A couple of resin kit producers were said to be considering the car, as were at least two producers of injection-molded styrene kits. But reality has finally arrived, and it is Jason Hill, of Owl Mountain Models, who has actually gone ahead to complete this project. I have just received a pre-release kit, and want to describe it in this post. My main goal is to make readers aware of this new kit, and only secondarily to offer a few comments about how the kit builds. The kit release is “imminent,” probably within a week or two. But the way to find out the actual release is on the Owl Mountain website, which can be found here: http://www.owlmtmodels.com/OMM_Aug_2017_News/OMM_August_2017_News.html . Right now it just shows news about the kit, but will soon have both an official release date, and also information on how to order kits. I will start by showing below a typical flat car of the type modeled in the new kits, SP 38892, a Class F-50-8 car built for Pacific Electric in 1923. (The 126 surviving F-50-8 cars were transferred to SP in 1951 and numbered into the 38840–38985 series.) The car was photographed in San Diego by Chet McCoid in September 1954, and the photo, from the Bob’s Photo collection, is used with permission. Clearly visible here is the wood blocking under the edges of the deck. Packaged with the new Owl Mountain kit is a nice summary of the prototype history, well abstracted from a book on the subject by some guy named Thompson. 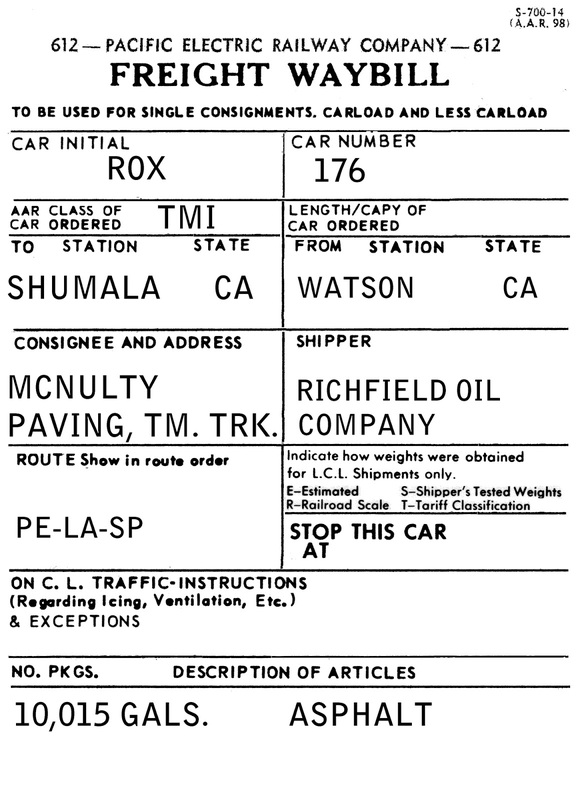 (To be more precise, Southern Pacific Freight Cars, Volume 3: “Automobile Cars and Flat Cars,” Signature Press, 2004.) There were some 4100 cars built to this basic design, starting with Class F-50-4 in 1910 (eventually 1800 SP cars, including 250 for Atlantic Lines, and 300 UP cars). The single-center-beam Bettendorf underframe design of Class F-50-4 had problems in service, so subsequent classes had double center sills. There were five more classes of these cars built after the F-50-4 cars. 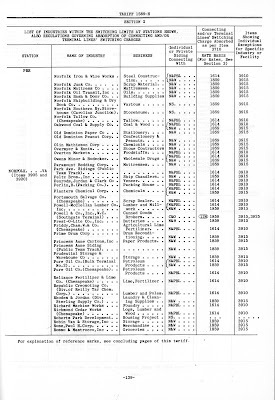 These five later classes can be divided into two groups: first, the cars of classes F-50-5, -8 and -9 (1650 cars, including 575 for Atlantic Lines) and a second group, classes F-50-10 and -12 (950 cars). These two groups differed most visibly in a change from T-section trucks to ARA cast-steel sideframe trucks. But the design of the straight side sills, with distinctive wood blocking under the overhanging deck, continued in use through the last such flat cars, Class F-50-12 in 1929. In fact, it is evident that all these later cars were built to the same fundamental design, because all were built to the same Common Standard specification, CSF-307. Thus the fundamental Harriman Common Standard design of Class F-50-4 continued in use for almost 20 years, justifying the use of the “Harriman” name for all these cars. Here is the kit as it is supplied, stapled in a plastic bag. The brown envelope visible in the kit bag contains precision-cut lead weights, and these are designed to hide neatly inside the underframe; they bring the car weight to around 3 ounces, a most welcome feature. 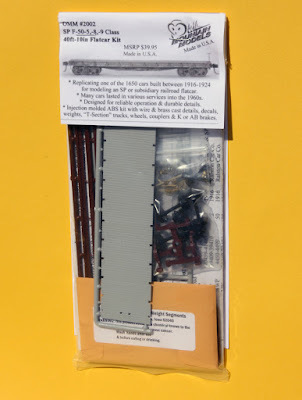 Opening the kit, there are four sprues, one in gray plastic, which is the plastic deck, and three in boxcar red (one comprising the underframe parts, the other two the side sills, and a variety of detail parts). There are also trucks, the lead weights just mentioned, a set of decals, and a small bag of detail parts, including some excellent brass parts, and Kadee couplers. Directions are detailed and very clear, with numerous drawings showing how parts go together. The assembly process is well thought out, and easy to follow. This post is only intended as an announcement of the kit’s release. But to get some feel for how well it goes together, I decided to go ahead and start the construction. I won’t describe that process here, but will reserve it for a future post. I can tell you, though, that the precision kit parts go together beautifully, reminding me of the better Tichy kits. Do read the instructions carefully, especially regarding what not to file off. The kit has several “locator” parts that must be left in place, well identified in the instructions. 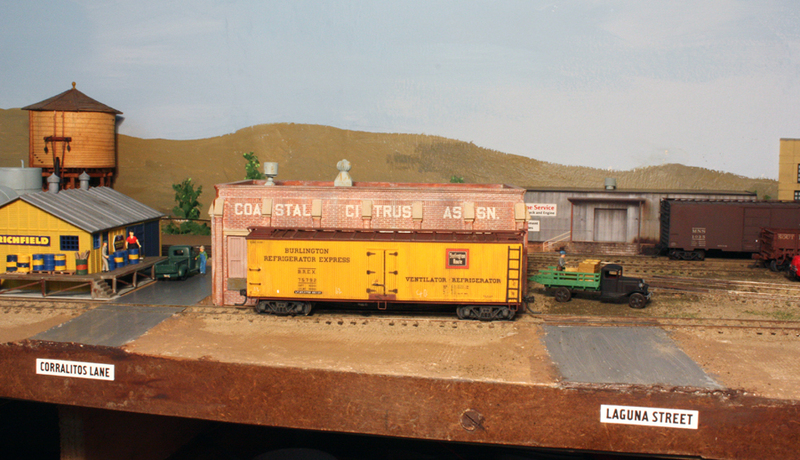 This kit makes up into a car that is a long-needed part of the Southern Pacific freight car fleet. I would expect that many SP modelers of the period before, say, 1956 will need more than one of these cars. You will enjoy building every one. In the previous two parts of this series, I wrote about making the most visible part of a shipping box or crate, the colorful end label on the box. 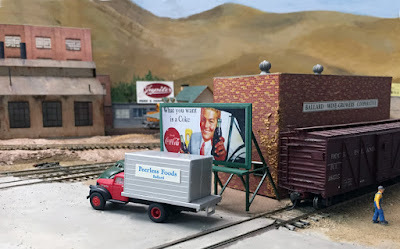 The previous post has a link to the first post, and can be found at this link: http://modelingthesp.blogspot.com/2017/08/produce-shipping-boxes-part-2.html . Now I want to turn to the physical boxes themselves. Shipping of fruits and vegetables was complex in a number of ways, and containers were only one of them. Containers not only varied by the individual fruit or vegetable, each with its own shipping container and method, but also regionally, with different producing regions having standardized on different containers. 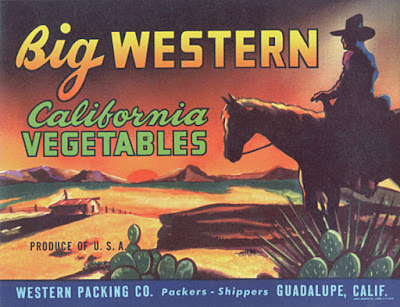 In the really big produce-harvesting states, container dimensions became enshrined in state law, in places like California, Arizona, Texas and Florida. But each state might well differ from others in standards for a particular product. Not only that, but practices changed over time, so a modeler wishing to research correct produce containers needs to choose era, location, and product. How can you ferret out historical data of this kind? As one might expect with a little thought, it was all set down in government pamphlets, mostly from the United States Department of Agriculture or USDA. 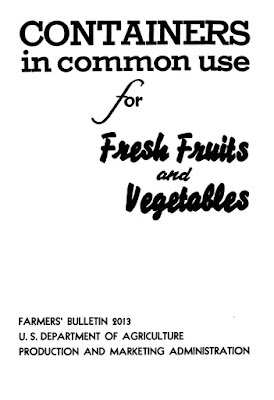 The USDA issued what were called “Farmers’ Bulletins” over many years, covering almost every conceivable topic in agriculture, and the bulletins in the series simply bore sequential numbers. You can Google the topic of interest to you, and sift through the results looking for USDA bulletins. This is available several places, but perhaps the most useful is the digital copy at the University of North Texas library, which you can read on line or print out. You can access this bulletin by using the following link: https://digital.library.unt.edu/ark:/67531/metadc3389/?q=%22Merchandising%22 . I will give some examples of shipping boxes relevant to my layout packing houses. 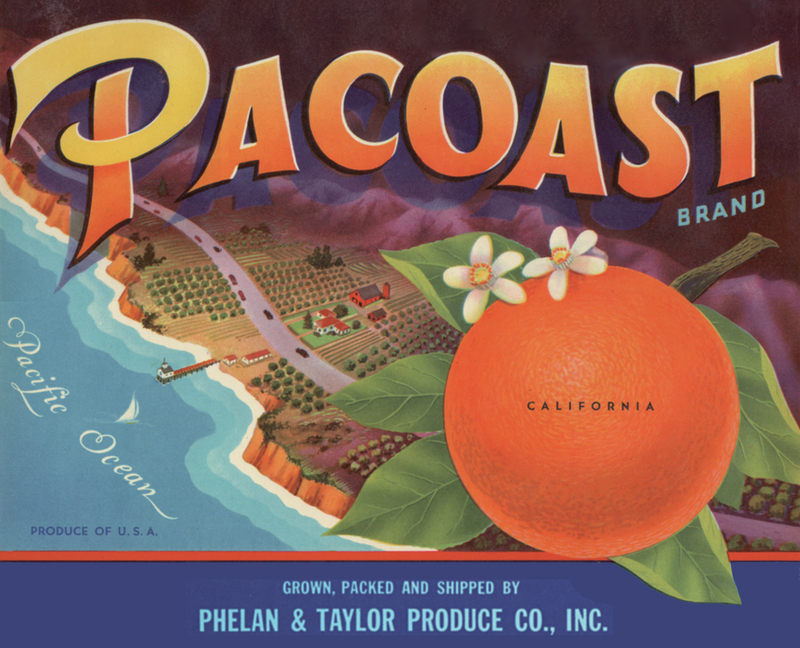 We can start with the familiar two-compartment orange crate, roughly 12 inches square on the end and 24 inches long inside (a full box like this weighed about 80 pounds). 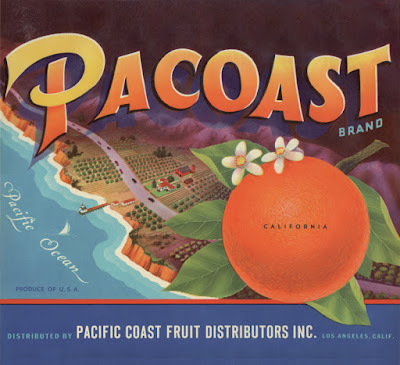 This size and square shape are well portrayed in nearly all orange box labels, such as the Pacoast label in the second post of this series (see it at: http://modelingthesp.blogspot.com/2017/08/produce-shipping-boxes-part-2.html ). 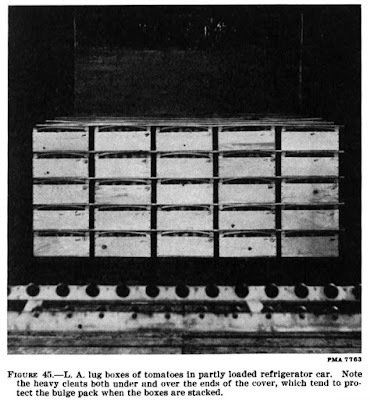 Here is a photo from page 40 of the Containers in Common Use booklet, showing such a crate. Note, incidentally, that although the actual label has been blacked out, the Sunkist “premium fruit” symbol of the tissue-wrapped orange has been left in place. 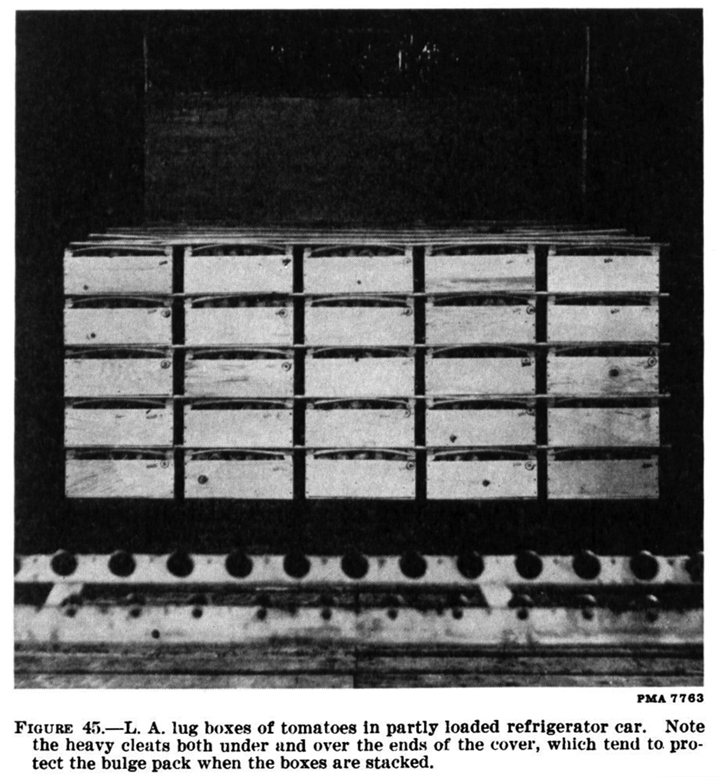 This image actually shows how the lugs were loaded in a refrigerator car. No labels are visible, presumably on the other end of the boxes. The Container booklet states that these flatter lemon boxes were 10 x 13 x 25 inches, and indeed, the size of the original label shown above is a bit over 9 inches high and 12 inches wide, which would fit neatly on the end of such a box. The sizes I have been quoting are California sizes. 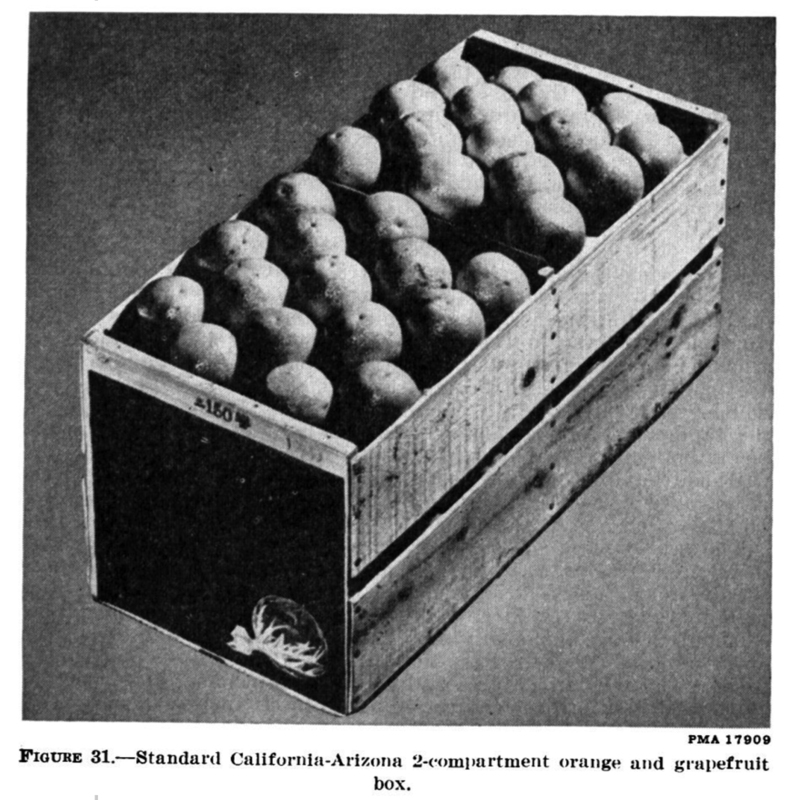 The Container booklet gives comparable numbers for shipping boxes of produce harvested all over the United States, so anyone modeling somewhere other than California needs to consult this source to determine shipping box sizes for their area. In passing, I should also mention that this 1950 Container booklet documents the first emergence of new shipping containers, such as mesh bags and cardboard boxes. They soon gained considerable use in produce shipping, another factor to keep in mind in making modeling choices. But for my 1953 shipping, I will follow what is in the booklet. So to wrap up, the first thing we need to know in building model shipping boxes is these box proportions and dimensions, depending on exactly which kind of produce it happens to be. For the orange crate, for example, we need boxes that are 12 scale inches in both height and width, so scribed siding with a 1 scale foot board width could serve for both the sides and top of a stack of boxes. One could then scribe the box length perpendicular to the factory scribing to indicate box length. 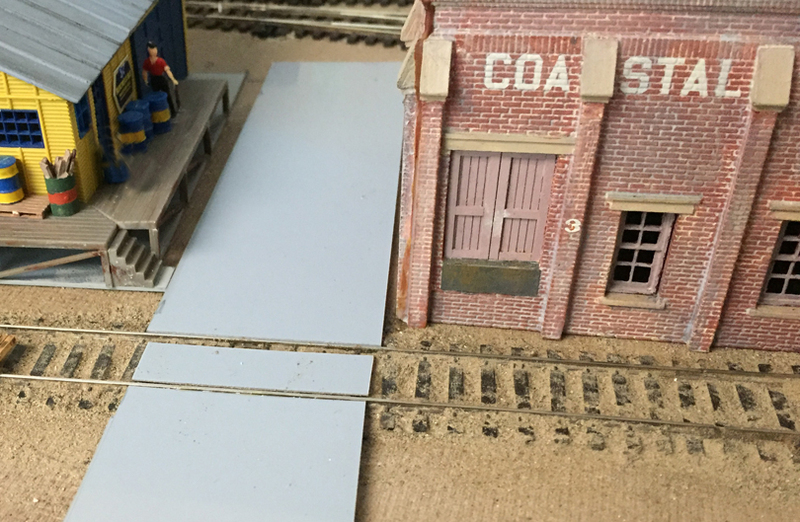 In the following post, I will show some other types of vegetable boxes, and also my attempts at modeling stacks of these for the loading docks of my layout packing houses. This topic has arisen a couple of times in questions to me, both directly to the blog posts, and also coming to me personally. One example is the question appended to a recent post in the Waybill series (you can read it at this link: http://modelingthesp.blogspot.com/2017/08/waybills-part-60-more-about-resources.html ). So I thought I would try and explain — and if I don’t get some of it right, I hope experienced railroaders among the readers will correct me. Any railroad, back in the transition era, could and usually did designate particular areas as “switching districts.” Such a district would normally be an area such as a town or city, so that shipments to or from any point in that district would move at the same rate. Then one can distinguish between “switching service,” car movement anywhere within the district, and “transportation service,” movement of cars from one town or city to another, perhaps all the way across the country. But what is of more interest is a district of this type in which two or more railroads, both serving the town or city area, agree to a “reciprocal switching agreement” within that district. This is sometimes explained as the roads essentially saying, “We will switch your cars if you will switch ours.” Although in principle these arrangements were to be subject to ICC approval, ordinarily there was no problem with such an agreement. Let’s see how this would work, using two railroads called A and B. Some shipper within the territory of the city served by A chooses to route his shipment over B, even though his siding is switched by A. This means B will get the freight revenue for its part of the line-haul or mainline distance that the load travels, and normally B will supply the empty to be loaded. That empty might be a car owned by B, or even more likely a car owned by some distant railroad, which I will call H. So the empty owned by H is interchanged by B to A, for movement by A to the shipper’s siding. After loading, the reverse occurs, and the loaded car is interchanged back to B for departure to destination. And incidentally, the waybill for this shipment will have been prepared by railroad B. What does A get out of this? It does not participate in the freight revenue from the line-haul or transportation service, so gets nothing from the eventual freight bill. But it is entitled to a switching charge for its work. Switching charges were computed on the basis of crew time, fuel consumption, and other costs, and are mutually agreed as part of the reciprocal switching agreement. Note also that during the time that the car from railroad H is on the rails of A, per diem costs will have to be paid by A. Here again, A can recover part or all of this per diem from B, in what is called a “per diem reclaim,” so that A is not paying too much for the switching process. Here again, the amount of reclaim is part of the mutual agreement for the reciprocal switching district. 5. An amount for each car in switching service may be reclaimed by each individual switching road from the road for which the service was performed. This amount shall be based upon the average time required by the switching road to switch cars for all roads, and determined by the roads directly interested for each local territory. So why would railroad A put up with all this? Their reimbursement for the switching work and per diem may not cover all their costs. But the benefit to A is that they have access to, and can try and recruit, shippers on the lines of B, just as B can solicit shippers on the lines of A. The rates are the same, so in this pre-Staggers Act scenario, there is no rate competition. The two roads have to compete on the basis of service or other factors. And a reciprocal switching agreement often saves time for both A and B. And how about B? It has to pay A a switching charge and per diem reclaim, which cuts into its revenue from the shipment. But it too has the ability to solicit traffic from A’s industries, a mirror image of A being able to solicit on the rails of B. It is important to recognize that the biggest part of railroad revenue was from moving loaded freight cars in transportation service. Per diem, switching charges, and many other small costs were minor expenses compared to the revenue of line-haul freight movement. So what a railroad really wanted was shippers using its tracks, even if some moderate costs might be incurred by participating in a reciprocal switching district. One place you can read more about these issues is in John Armstrong’s superb book, The Railroad – What It Is, What It Does (Simmons-Boardman). It was originally published in 1978, now is in its 5th Edition from 2008, and is still available new from the publisher on their website: http://www.transalert.com/cgi-bin/details.cgi?inv=BKRRNN&cat=18 . This is a great resource even if you know quite a bit about some aspects of railroading, because this book gives you the background for those areas you don’t know as well. And if you want to get the earlier editions as a better window into earlier times, they are readily available from online booksellers such as AbeBooks. 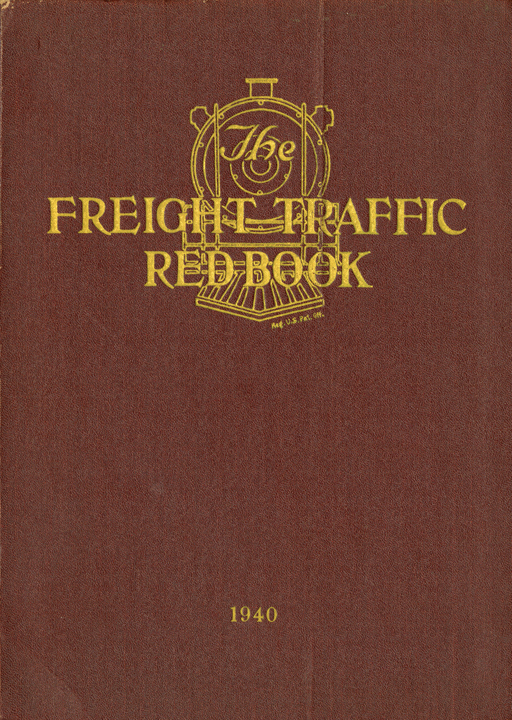 If you want to learn really a lot about this subject, albeit at the cost of some intense reading and thinking, you can find it all in The Freight Traffic Red Book, published by the Traffic Publishing Company, New York, in annual editions. I have a copy of the 1940 edition, an 8.5 x 11-inch book. It contains 1316 pages, much of it citing actual AAR, ICC and other rules, along with interpretations and explanations, It’s a highly informative book, but probably not the place to start learning about anything. 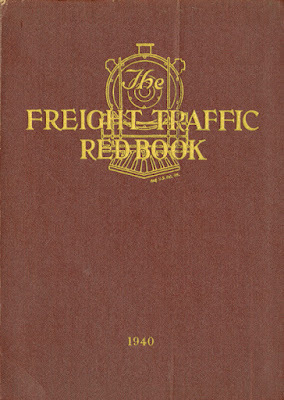 Google has digitized the first edition, from 1920 (it’s at: https://books.google.com/books/about/The_Freight_Traffic_Red_Book.html?id=qRopAAAAYAAJ ). The books continued to be published at least as late as 1955. They can often be obtained from online booksellers. I know these levels of detail are not of much interest to most model railroaders. 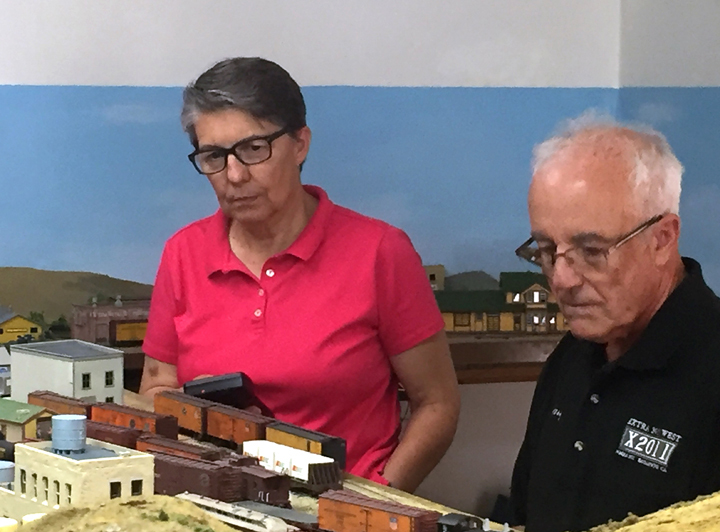 But I like to understand how railroading was done in the era I model, to support my goal of reproducing as much of the operations and language of the period as I can. 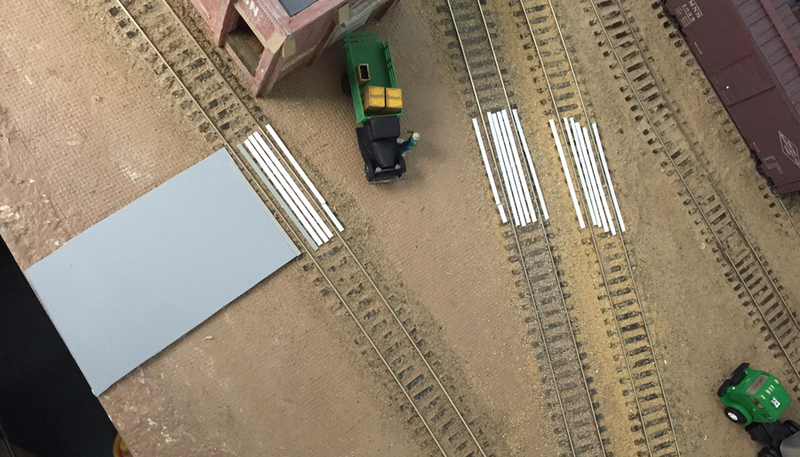 In Part 1 of this series, I introduced my project of making stacks of shipping boxes for the produce shipped by my layout’s packing houses. 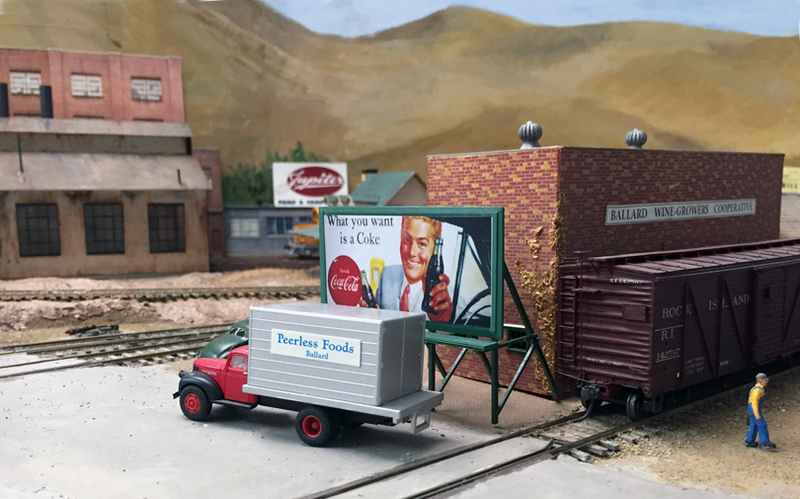 (You can read this post at: http://modelingthesp.blogspot.com/2017/08/produce-shipping-boxes-in-ho-scale.html .) I showed how I have modified some box labels to suit my own packing houses. In the present post, I want to show more examples of this label modification, and begin my model project. My Phelan & Taylor packing house is primarily a vegetable house, as was true of the prototype in its day. 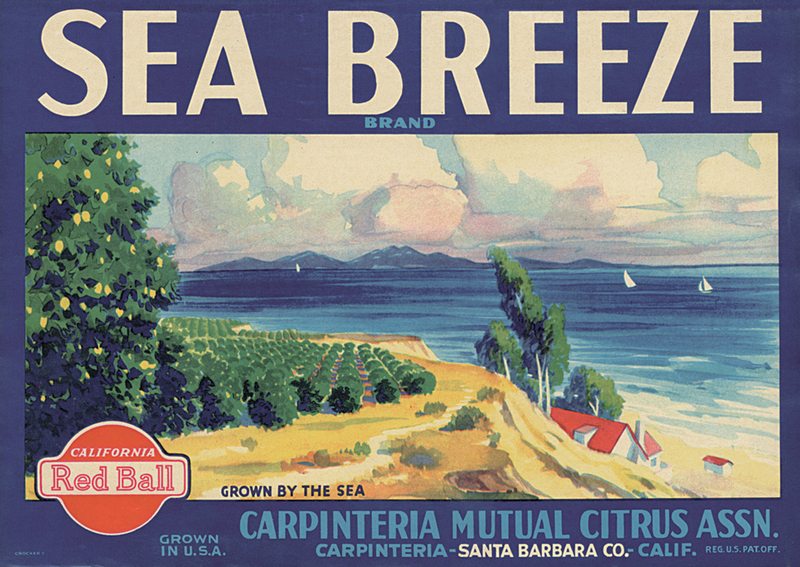 But there are modest quantities of oranges grown in this area, so I wanted to create an orange label also. 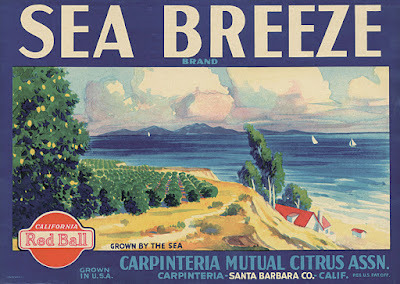 Many citrus labels are quite busy and would not reproduce well in HO scale, so I wanted to find one with a simple design. Here is what I chose. It was actually used by a Los Angeles distributor. The large lettering and the large orange in the image seemed ideal for reducing to HO size. I simply replaced the lettering in the blue field at the bottom to suit Phelan & Taylor. 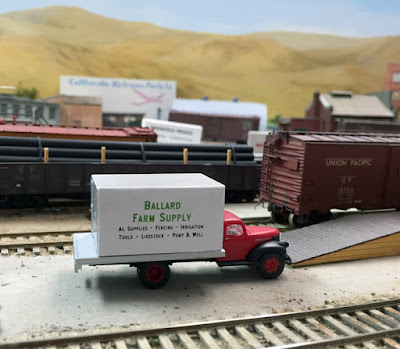 Another packing house on my layout, in the town of Ballard, is also a real packing company in the area, Western Packing. I have only found one of their labels so far, though it is a handsome one, as you see below. 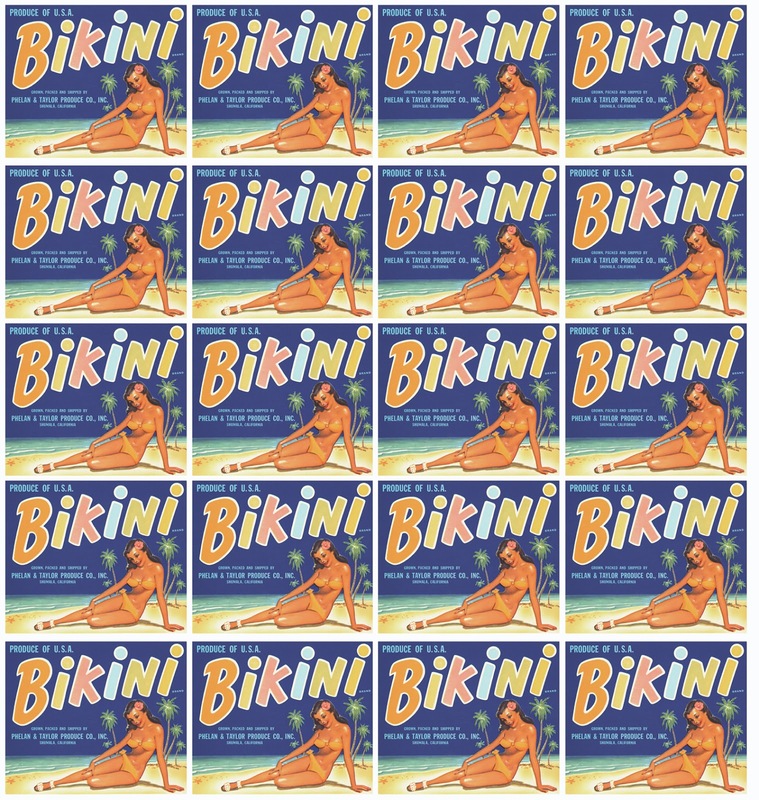 The problem here is that the design is rather busy, as are many original labels. To illustrate that point, here is the label as reduced to HO scale and made into a box stack, like the one I showed in my previous post on this topic. The labels become a blur of color. I will use such a stack (or two), but here the impact of the label design is largely lost. 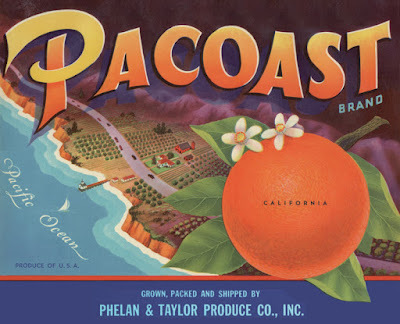 Finally, here is one more label that I have yet to modify, probably for Phelan & Taylor, which I like because of the very “1950s” design look, and it reduces to HO scale all right. Shown below is the original, not yet modified to my own packing house name. 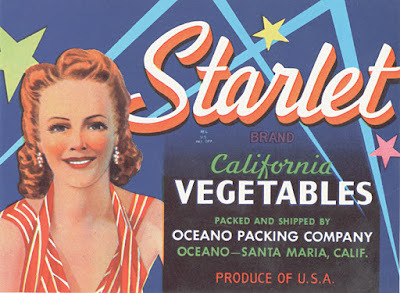 Incidentally, this packing company is still in business, not only in Oceano and Santa Maria, but with some facilities elsewhere in California and in Arizona. I showed their Oceano sign in a previous post (you can view it at this link: http://modelingthesp.blogspot.com/2012/11/visiting-area-you-model-part-2.html ). Making the stacks of boxes is critically reliant on the labels, as they are by far the most noticeable part of a shipping box, and I think I am up to speed on groups of HO scale labels. Next step: build the stacks of boxes. That requires a return to the topic of box dimensions, which I will address in the following post. At the time I model, the largest plant was located at Bishop, Texas, southwest of Corpus Christi and served by the St. Louis, Brownsville & Mexico subsidiary of the Missouri Pacific. Accordingly, I use inbound waybills from the StLB&M. Several of the MoPac subsidiaries had their own AAR code numbers and separate waybills, including StLB&M. 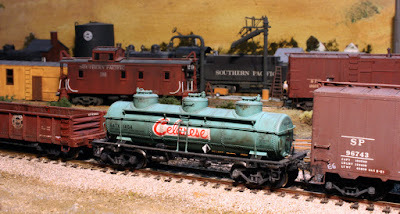 There have been a number of commercial models, at least in HO scale, of Celanese cars. Some are reasonable versions, and I have a couple myself. But what I want to talk about in this post is the challenge of doing the paint and lettering for a typical Celanese car that is different from the commercial versions. Celanese tank cars pose a challenge as to paint schemes. Most cars were green, but color photographs show a range from dark green, through a kind of pea-soup green, to light green. Some cars had dome stripes, either cream, dark green (darker than body color), or black; other cars had no dome stripe. The company name was spelled out in a stylized script, in colors ranging from black or brown, to light or dark shades of red (sometimes on a white background, sometimes right on the green), and of widely varying size. 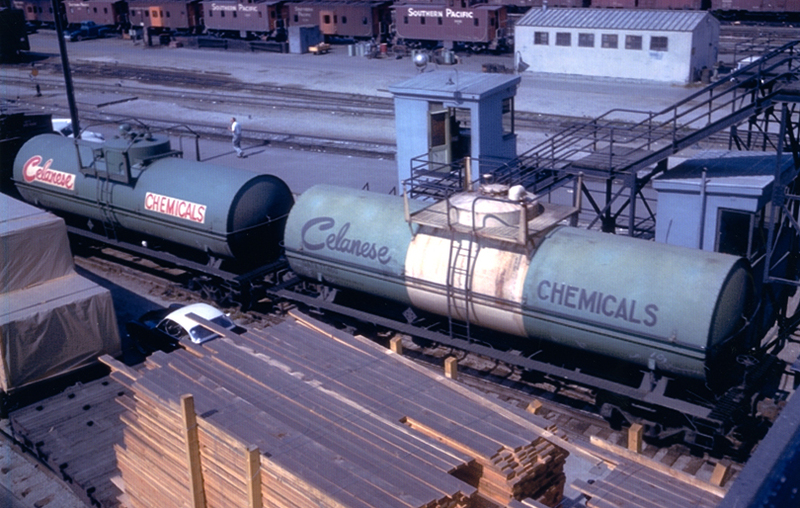 Here are examples of just two of those variations, in a photo from the Richard Hendrickson collection, obviously taken at SP’s Taylor Yard in Los Angeles, but I don’t know date or photographer. One might conclude that almost any paint scheme with some combination of these decorative elements would likely be correct for some car. And as can be inferred from these two photos, the ranges of colors seen in prototype photos may well represent simple fading in service, as well as possible variations in original paint color. In other words, the car at the right in the color photo above may have originally been the same darker green as the car at left. 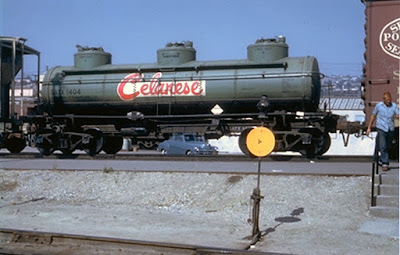 I should hasten to say that I already have a couple of Celanese tank cars. One is a Precision Scale brass car, the upgrading of which I described in a post few years ago (see it at: http://modelingthesp.blogspot.com/2012/12/small-modeling-project-brass-tank-car.html ). Here is a repeat of the model photo from that post. The color chosen by Precision Scale is certainly gaudy but does fall into the range seen in prototype photos. The model paint scheme and car number, GATX 1404, accurately mirrored the above photo. Here is a view of my model, with weathering added to the ready-to-run model. Since I have the Tangent model with the red lettering on a white rectangle, and the brass one with the lettering on an all-green car. I decided to aim for one of the cars with a cream dome stripe. 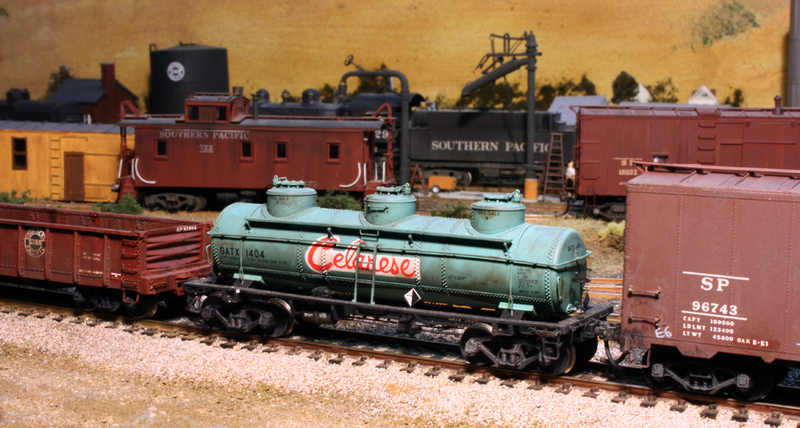 It’s a striking scheme and would make a contrast to my other Celanese model tank cars. I haven’t decided yet as to the car type I want to model. It might be possible to start with either a 10,00-gallon car, such as an InterMountain tank car, or perhaps the old insulated Athearn tank car, always labeled by Athearn as a “chemical” tank car, though the term is meaningless. I will take up the modeling part of this story in a future post or posts, depending on the extent of exactly what I decide to do to create the model. Like any such story, use of prototype information is essential, and I will explore some of that further in the following post. There are two possible meanings to the title of this post: the individual HO scale boxes themselves, and a suitable representation of a stack of such boxes. I am going to write about the latter meaning in this post. I have several packing houses on my layout, and would like to depict stacks of boxes on the loading docks, ready to load into PFE or other reefers. 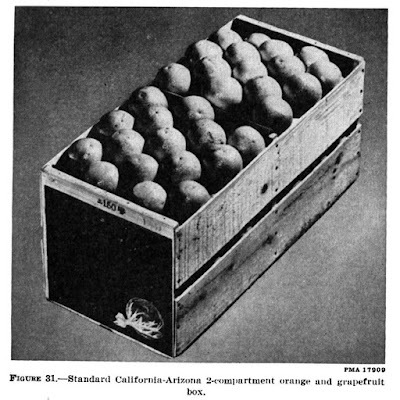 The first issue is box dimensions, and obviously a stack of boxes in HO scale would simply be an appropriate multiple of the scale size of the box for a particular kind of produce. Box dimensions are not a simple topic, by the way, as each fruit or vegetable had its own size and shape of shipping box. But given the size and shape for, say, oranges, a stack of boxes would be easy to model, perhaps with a styrene box, maybe scribed to represent the individual boxes in the stack. I will come back to making these boxes. There is also a second issue: labels on the box ends. These were a colorful and distinctive part of the box, and certainly cry out to be modeled. 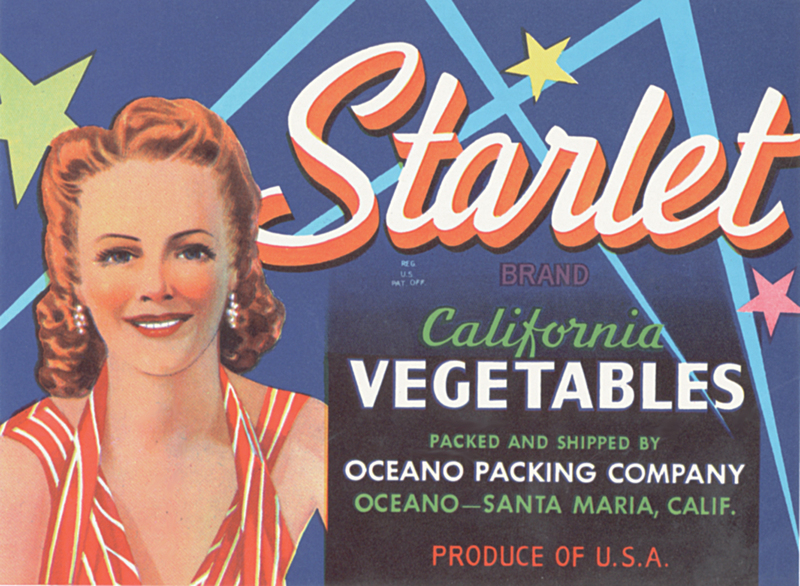 Many fruit and vegetable box and carton labels have been preserved at museums and can be found on-line. Many thousands were still in stock at some packing houses when they closed, and these original labels have been sold by dealers for years, and are still available. 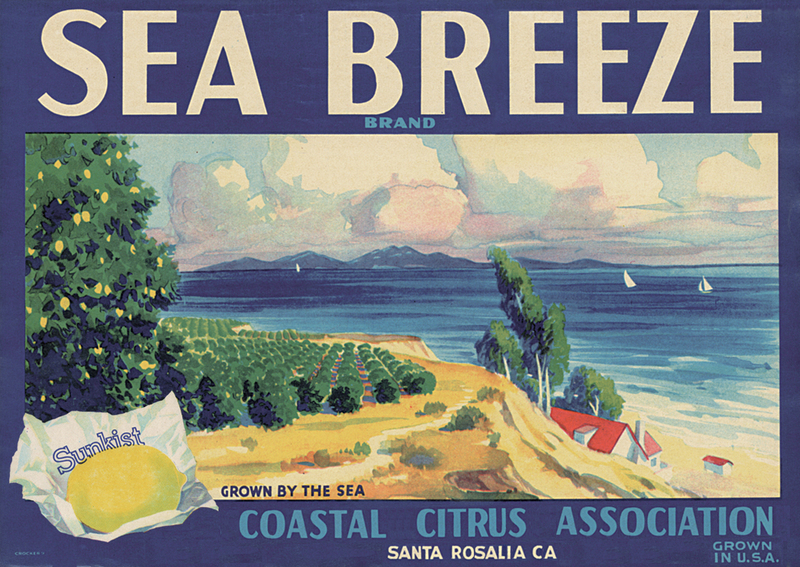 If you Google “fruit box labels,” for example, you will turn up a list of dealers in these originals, such as http://www.thelabelman.com/ . I myself have bought a number of labels for packers in the Central Coast area of California, where I model. 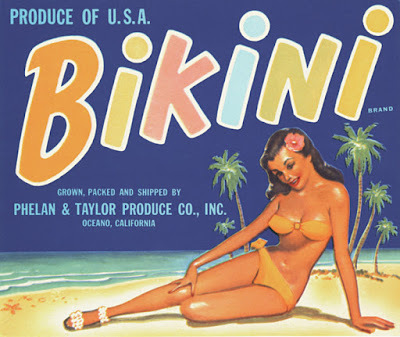 But a particular label that you like may be for a slightly different area, maybe the adjoining county, and perhaps the packing company name is not one you wish to use. With modern image editing applications (Photoshop is just one), I would submit that it is truly easy to modify these labels as you desire. 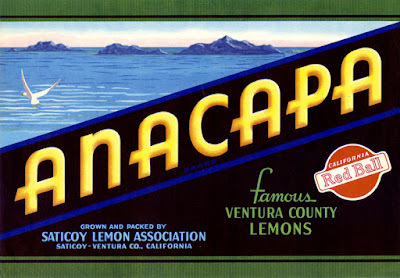 I will illustrate with one particular label, for a brand of lemons packed in Carpinteria, California, on the SP Coast Line, but in Santa Barbara County, some ways from the area I model. Here is the original label. The same process can be used on many different labels. 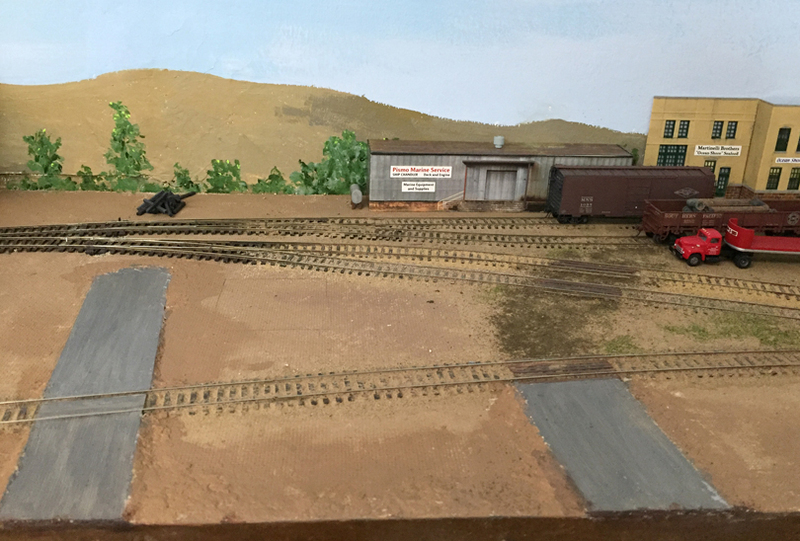 Shown below is one that I really wanted to use, because it is from an actual packing company, Phelan and Taylor, that I model on my layout. Incidentally, while looking at this label, I should repeat something that was stated in my column about PFE operations in the September 2013 issue of Model Railroad Hobbyist [you can download any MRH issue, or read it on line, at any time, for free, at their website, www.mrhmag.com ]. 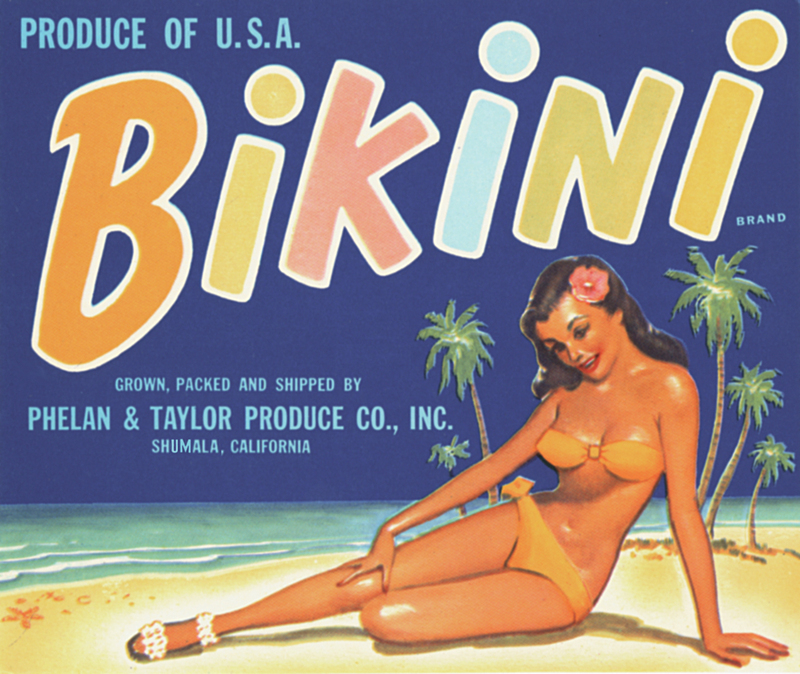 The point is this: modelers often wonder why packing box labels so often contain images like this one, having themes appealing to men, rather than to the women who traditionally did the household shopping in that era. The answer, of course, is that the housewives rarely saw an entire packing box. These boxes were seen only by the male (in those days) wholesale grocer’s buyers. The labels were aimed at them, not at housewives. Here again, the label now reads correctly for my modeling situation. 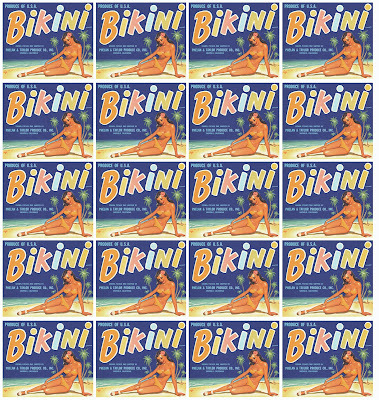 You are entitled to consider me a little compulsive to have adjusted this tiny lettering on the Bikini label, since in HO scale it will be seriously invisible. But I plan to make some full-size copies as decorations for the layout room, so visitors can see the labels. These are not HO scale as you see them in this blog, but I wanted to illustrate the idea. 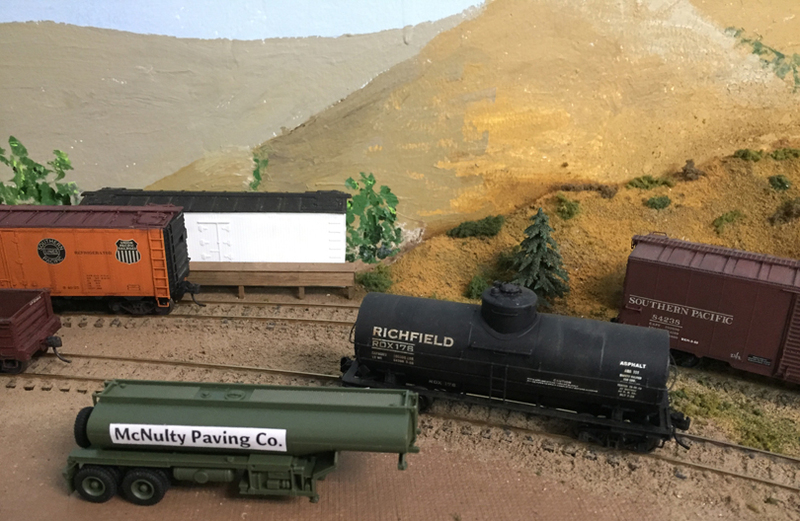 I have been pursuing this kind of label modification, and reduction to HO scale, for several packing house labels which suit the industries on my layout, and I will come back to some of these additional labels, and to the HO-scale stacks of boxes that are modeled, in a future post or posts. In the long series of posts I have been creating about waybills, I have alluded in passing to many resources for those seeking more information. 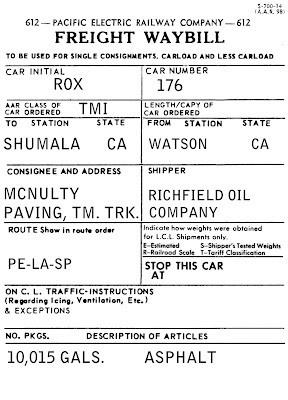 Those posts are readily found using the search box at right, with the broad search term “waybills” or the narrower topic, “waybill resources.” The principal post, and one in which I showed essential books as well as the copy I have of a freight tariff, can be found here: http://modelingthesp.blogspot.com/2012/02/waybills-18-resources.html . I occasionally get questions from modelers about finding still more resources, and I often comment that you need to use your imagination and guess what items might be out there at libraries and archives, or for sale on auctions such as eBay. 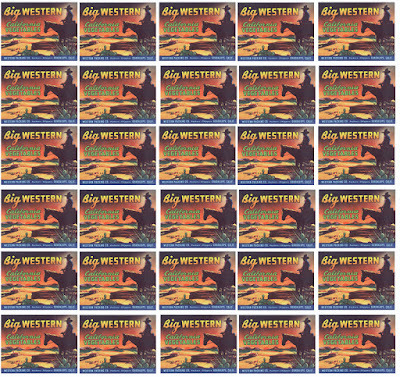 In fact, browsing eBay for railroad paper can be quite informative. But there continue to be really excellent items of railroad paper that float through your field of view, if you are just attentive. I will include here two examples, both originating from the Pennsylvania Railroad, that I obtained in the Pittsburgh area. Both concern switching districts and tariffs, and are endlessly fascinating, at least to me. 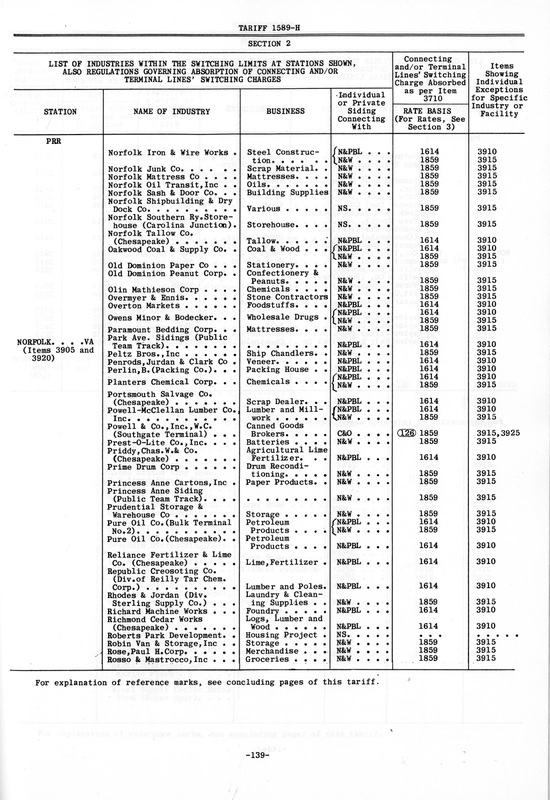 The older of these, that went into effect March 1, 1955, contains a list of industries, though not extensive. It just covers the Pittsburgh Switching District, intense as that was. 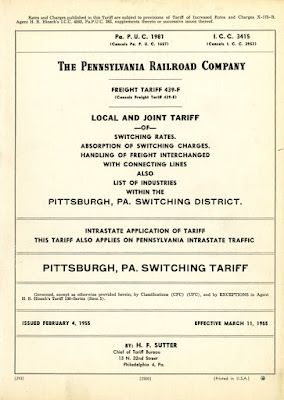 There is a great deal of information in here about switching rates and handling of switching charges between railroads, and not so much of what modelers might like to read, about the industries and industrial districts. 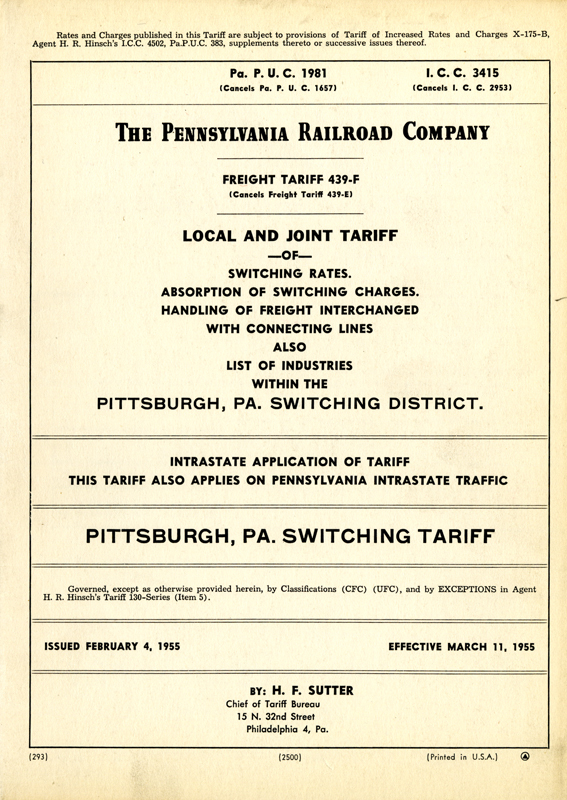 The second item is also a switching tariff listing, but from 1968. 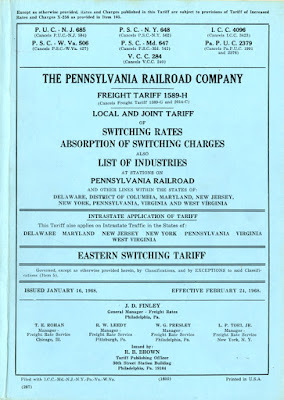 Its cover is shown below, and as clearly indicated, it if for a number of eastern states in which the PRR operated. 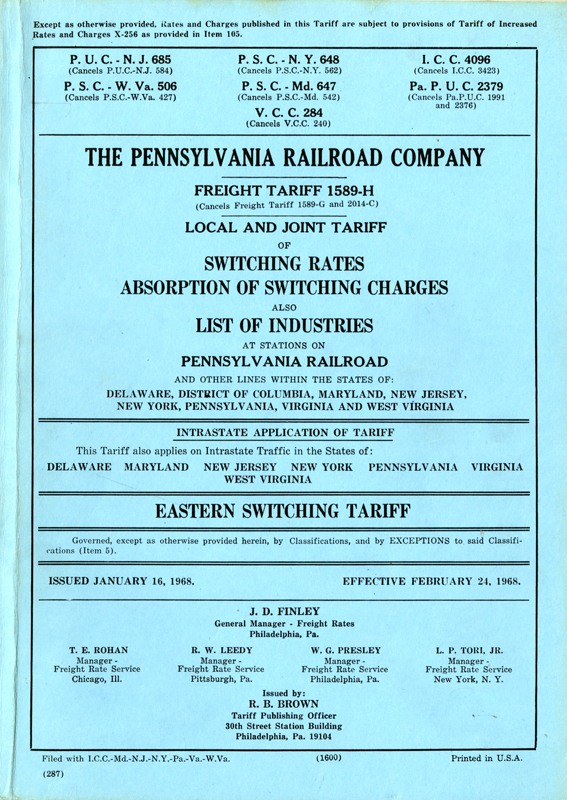 For this tariff, these were Delaware, District of Columbia, Maryland, New Jersey, New York, Pennsylvania, Virginia, and West Virginia. These listings are not comprehensive, that is, they do not necessarily include all industries in a particular town or city, only the ones that fall within a switching district. These districts were created by mutual negotiation and agreement among the participating railroads. But limited or not, this is a rich source of prototype data. This kind of information is so valuable for the person creating waybills, it is difficult to overstate. I personally work through these books frequently, looking to match shippers with my on-line layout industries, as well as to identify consignees which my layout industries might ship to. For me, it is part of the fun. I have just held two operating sessions, in the afternoons of August 8 and 9, partly so I could have my packing house for tree fruit still operating. That packer is shut down for most of the year, so I really like summer sessions to involve carloadings there. “Wait,” you may say, “why care what month it is?” The reason is because I always treat an operating session as being held on the same date in 1953. Thus the sessions I just held were handled as though happening on August 8 and 9, 1953. That enables me (or, if you wish, compels me) to follow seasonal produce harvests.For background on this idea, you can read a couple of my previous posts (especially this one: http://modelingthesp.blogspot.com/2015/09/seasonality-of-crops-and-traffic.html ). So these August sessions were fun for me in that I had all packing houses operating. I had also completed some more track ballasting, added some more soil and ground cover, a couple of new streets (as I described in this post: http://modelingthesp.blogspot.com/2017/08/modeling-grade-crossings-part-2.html ), and several additions to buildings and industrial areas. I had even added some static grass in a few areas. Here is the hillside across Chamisal Road from the Shumala depot. 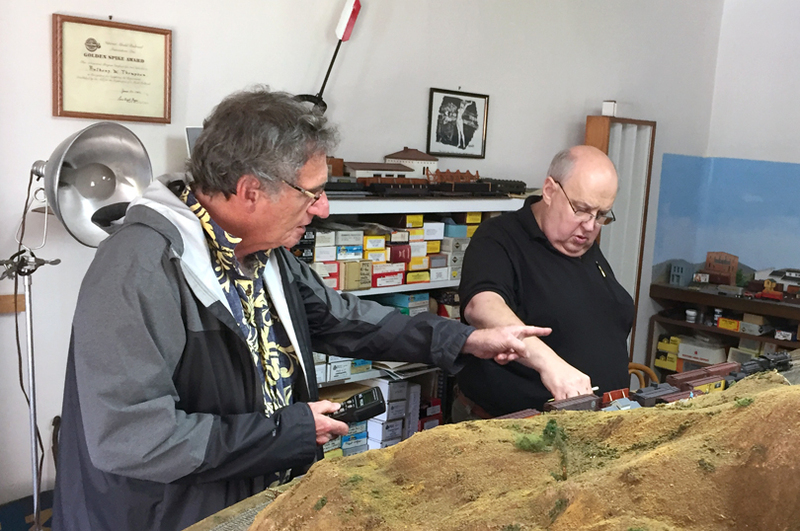 But beyond the layout changes, an additional attraction for me in this session was the chance to introduce several different patterns of freight car movement. 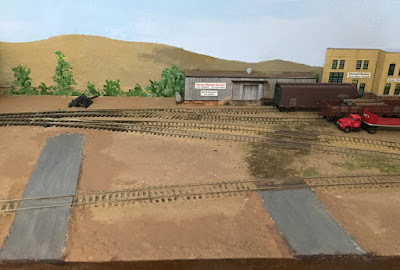 I try to vary how things are done in the switching each time the layout is operated, so that each operating session is not simply another set of the same patterns. I managed to do that in several areas in these sessions. The first day, crews were Jim Providenza (and observer Adam Palmer), Linton von Beroldingen, Ray deBlieck, and Ed Merrin. 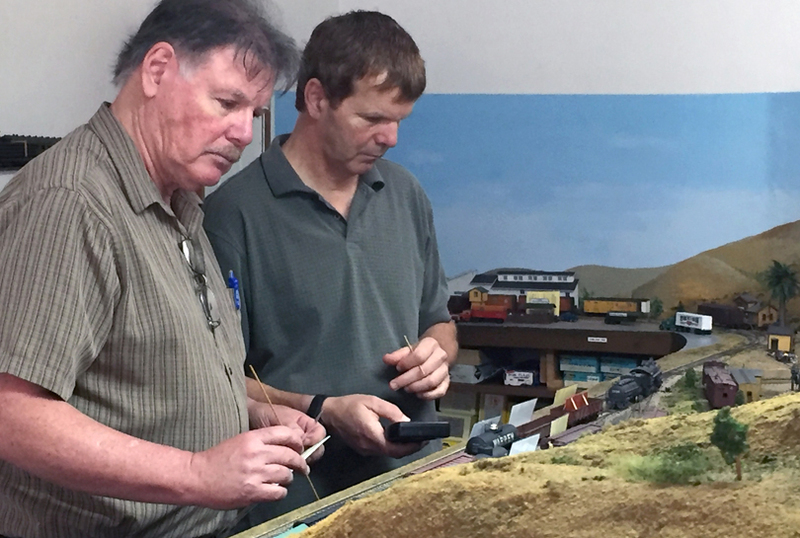 Shown below working at Ballard are Jim and Linton, with Linton suitably dressed as a conductor, the job he was in fact doing. Adam was just out of the picture. Meanwhile Ray and Ed were hard at work too, switching at Shumala. Ed was engineer on this crew, but appears to be directing Ray’s attention to something vital. The next day, the crew happened again to be five, Larry Altbaum, Lisa Gorrell, Paul Weiss, Richard Brennan, and Earl Girbovan. Paul and Lisa took turns on the crew with Larry. I didn’t get good photos of everybody, but here are Lisa and Larry, engrossed with a set-out at Ballard. 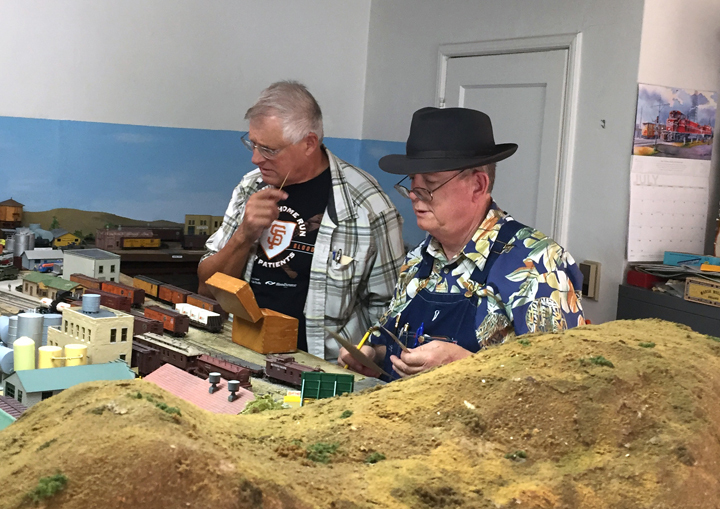 Meanwhile, the team at Shumala was Richard and Earl, shown here in the midst of sorting cars by destination, usually the first job in this yard. These were fun sessions for me, both to set up and to observe, while these capable visiting operators solved the various switching challenges that go with this branch-line layout. 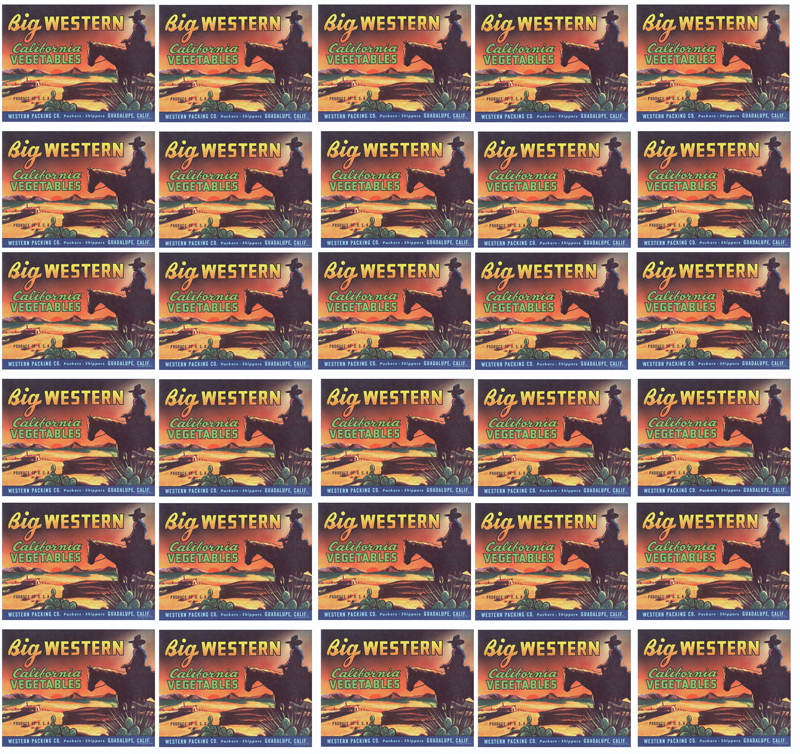 There were a few of the inevitable glitches, all correctable (I believe! ), and I’m already looking forward to the next sessions. 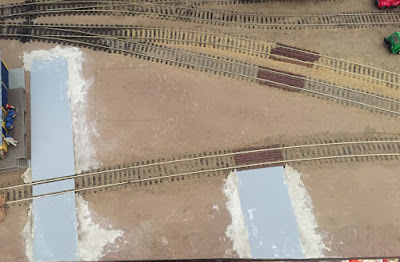 I have shown and mentioned some of my layout grade crossings in previous posts, but several of them were covered in more detail in the post that, logically, precedes this one (see it at: http://modelingthesp.blogspot.com/2014/02/modeling-grade-crossings.html ). I have done all-paving grade crossings, and ones that combined paving plus railroad ties, as well as a couple of them using ties only. 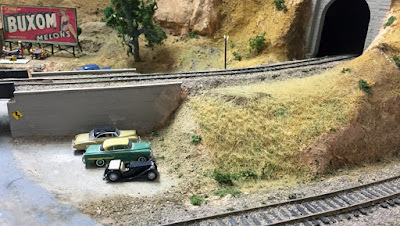 The latter type was shown in a post here: http://modelingthesp.blogspot.com/2015/01/the-road-behind-roundhouse-part-2.html . I needed some additional grade crossings as I develop my layout town of Santa Rosalia, and I wanted to try a little different approach. For one thing, though prototype grade crossings have the fundamental principle that the crossing is level with, or slightly higher than, the rail head, on a model railroad this is a problem when track is being cleaned (and can be a problem for rolling stock with close underneath clearances). So although some of my other grade crossing are pretty nearly level with the rail, more recent ones are carefully set below the rail height, and I wanted to try to go even a little further with that. I can remember seeing some prototype grade crossings that were little more than a few planks laid between and beside the rails to provide a minimally uniform height to the crossing. I decided to try and model some of that kind. The prototype naturally uses thick planks, but I decided to use thin ones, just to keep the planks below the rail head. I chose to use scale 1 x 8-inch Evergreen styrene strip, glued down with canopy glue. These were not tightly fitted, as crossings with much traffic would be, but are simply laid between and outside the rails. Meanwhile, I decided to make some asphalt roadways too. For this, I chose Plastruct ABS sheet, which is already a nice gray color, and the thickness of 0.020 inches fell well below the railhead of this Code 70 track. These roadways were also attached with canopy glue. Here is how it looked, for the road leading to the plank crossings, with planks of white styrene. The building you see is the corner of the Citrus Association. This road will be Laguna Street. The other road I decided to install was the road that runs between my Richfield oil dealer and the Coastal Citrus shipping warehouse. This street is Corralitos Lane in Santa Rosalia. Here is its original look, with the pavement ending near the track in the background. This road is fairly narrow, more of an alley than a city street, and represents the endmost part of a standard street. Once the plank crossings were installed, the next step was to paint them a “wood” color. I used Star Brand no. STR-11, Seasoned Brown Wood, as a base color on the crossing planks. I also needed to provide shoulders to the roadways. For that, I used my trusty taxidermists’ paper mache. I have discussed this material before, with its superb fine grain and smooth finish. The one I use is Brandt’s Compound, from Robert Ruozzi of Irwin, Pennsylvania. With that done, here is the project, showing both roads and with the Citrus building removed. The crossing planks are kind of stark here, too dark a brown color, and will be weathered. The paper mache areas next need to be painted an “earth” color, and I used my usual Rust-Oleum color “Nutmeg” for this. That is the color of the surrounding areas, pending ground cover or soil. I also wanted to paint the road surfaces. The natural ABS sheet is not a bad color, but is quite glossy and much too smooth and uniform. I used tube acrylic paint, mostly Neutral Gray, to paint the road surfaces, with admixtures of very small amounts of Burnt Umber and Black. While I was there, I used some natural dirt and a little Woodland Scenics soil and “turf blend” to get a basic ground cover in the area. Some of the natural dirt was rubbed into the crossings. Below is a view of the area at this point. This has been an interesting variation in grade crossing styles. I now have a total of 23 grade crossings on my layout, no two exactly alike, though there are only a few general styles. I showed earlier ones in the previous posts on this topic (links in the paragraph at the top of the present post), and this post shows more of them. 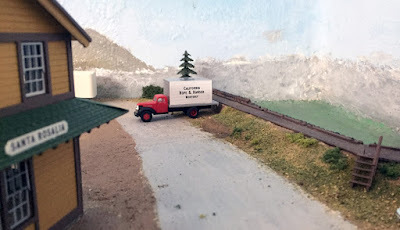 In a four-part series two years ago, I described several approaches I have been taking to model highway trucks, both van or box trucks and also semi-trailers. Here is a link to the fourth of those posts, and you can track back through the series, with each post containing a link to prior ones: http://modelingthesp.blogspot.com/2015/07/modeling-highway-trucks-part-4-more.html , if you are interested. In the present post I want to address one particular aspect of such modeling: including local owners. I raise this point because so many commercial models of van trucks and semi-trailers are decorated for familiar brands and companies, well-known regionally or nationally, whether Coca Cola or Carnation Milk or Rath Meats or Schlitz Beer. 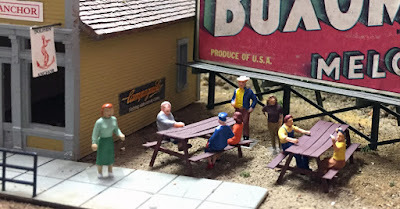 These are fine, of course, and represent, in a way, another angle on the “beyond the basement” feature of a model railroad, suggesting the presence of those recognizable brands even on the little piece of the planet represented on your layout. 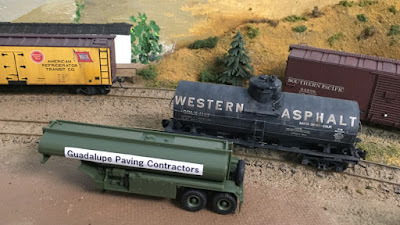 And my interest in having such vehicles on my layout is not only to remind visitors of those on-line businesses, but almost more importantly, to serve as a “scenic link” to industries which are not modeled on the layout. These are businesses which are rail-served via house tracks and team tracks, and have to send a vehicle to pick up the cargoes delivered in that way. Turning from delivery trucks, such as the Peerless truck shown in the photo above, to examples of trucks making pickups, I show below a truck of Ballard Farm Supply, a company which receives a variety of materials and equipment via the house track and team track in my layout town of Ballard, though there is no siding for this business. The truck is shown at the Ballard team track. All these examples are conventional trucks. I have also made up a tank trailer for road asphalt, with two different company owners, one on each side (thereby getting two off-line industries with one trailer!). Such a trailer can be spotted alongside the team track in the appropriate town, obviously waiting for this tank car of asphalt to be spotted. The company name here is a familiar regional one, at the Shumala team track. Below is the other side of that trailer, using a different company name. There was once a construction company with this name in San Luis Obispo county. Each of these ways of using trucks or trailers decorated appropriately for local or regional owners adds to the specificity of your layout locale, and, as in the case of the asphalt shipments and of Ballard Farm Supply, even helps your team track make better sense as a destination. 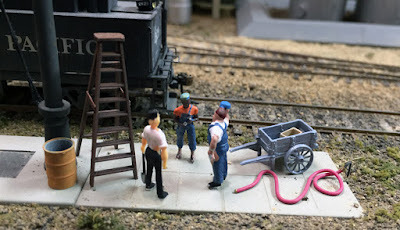 In several prior posts about model figures for layouts (in my scale of HO), I have described some approaches to painting and repainting figures, as well as modifications you can make to some figures (contained in the first five posts in this series; you can use the search term “figures” in the search box at right to find them all). The most recent post talked about placement of figures, that is, effective ways you can position figures on the layout (see that post at: http://modelingthesp.blogspot.com/2017/06/figures-part-6-placement.html ). The present post extends that discussion. One type of group you can easily represent is workmen (or any kind of people) engaged in conversation, perhaps as a break from whatever work or activity they are doing. 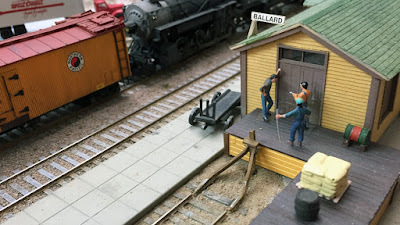 The scene below is on the freight platform of my SP depot at the layout town of Ballard. And of course you can always add an obvious bystander, observing the work (I had a neighbor once who loved to repeat the saying, “I love work. I could watch it for hours.”) The observer, or a supervisor, watching the work is a common situation. In the photo below, the supervisor, holding a clipboard, stands at right. You may note that one of the workmen is African-American, as is almost always the case in photos of groups of SP workmen. 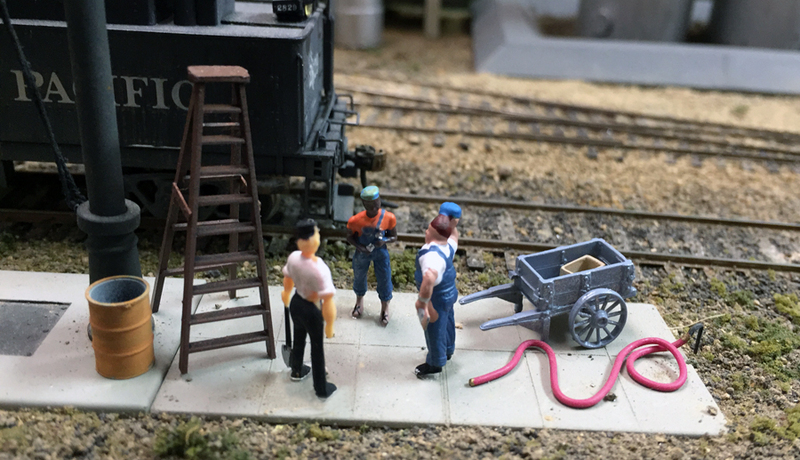 This scene is at my engine terminal in Shumala, with details described in my recent article in Model Railroad Hobbyist (August 2017 issue). Below is another grouping, at the Shumala depot on my layout. This depot, incidentally, is scratchbuilt, and its design and construction,, following actual SP depot plans, was described in one of my columns in Model Railroad Hobbyist, the issue for November 2012 ; you can read any issue on line, or download it for free, any time at their website, which is at: www.mrhmag.com . 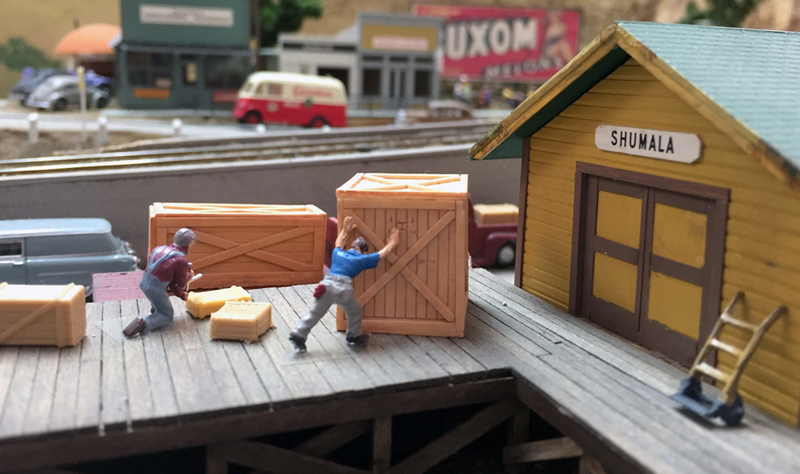 These two workmen are handling cargoes unloaded on the freight platform of the depot. The figure on the right is the one I showed being painted in Part 5 of this series (at: http://modelingthesp.blogspot.com/2017/05/figures-part-5-more-on-painting.html ). Finally, I showed a grouping at my Shumala tavern, the Dolphin and Anchor, in the previous post (link provided in the first paragraph of the present post). The key to this scene, as mentioned in the previous post, is the picnic tables. Here is a view of one from above. I have since rearranged the grouping shown previously, with added sitting as well as standing figures. I want the tavern to be enjoying a full group of customers. These scenes are intended only to suggest ideas for effective figure placement. My layout has none of the standard “cute” scenes, such as a police car pulling over a motorist, but instead concentrates on attempting to show everyday people doing everyday tasks. For me, it makes for a more realistic layout flavor.